I saved my Saturday to grace The 4th Philippine Blogging Summit held at the Malcolm Theater of the University of the Philippines-Diliman College of Law. I figured that instead of enriching the mall magnates through my impulsive spending, I allowed myself to join the community of bloggers across the archipelago the whole day of 26 April 2008 to be educated for matters hovering cyber posting and the intricacies therein. The participants were a combination of professional and newbie bloggers aiming to advance the role of cyber writing in the Philippine arena. I was even surprised to witness a child, approximately eight years or less in his age, well of course with guardian with him, as a registered attendee with a complete identification, i.e, nametag, like ours. I felt pretty privilege to see the personalities making a big wave in the blogsphere. They were just ordinary person like me - devoted enough to thrive awareness about the significance of blogging as personal nook, business avenue, and as an alternative for traditional media. Like anybody, they have started with the small seed of passion for writing and have unique stories how things all started. There were no eccentric attitudes and psychotic tendencies manifested in their actions and behaviors. Less, there were no impressions that they could be considered as weird and freaky. Though often stereotyped, as also brought out during the summit and oftentimes masquerade in a covert identity, they – including myself, are just living in the bounds of sanity. Thanks God!!! Honestly, I don’t have much expectation with me when I signed up for the summit. In mind, I just want to associate with the bloggers myself and to unravel handful of technical dilemmas incumbent with my present inclination – that is blogging. But, I had more when I went home – more boldness and more encouragement to ferret what could be my enormous contributions in uplifting the society at large - a social responsiveness and obligations I surmise. This is not just a motherhood statement, but a collective endeavor in exploring the vastness of propensities through active involvement in the advocacies affecting the society in general. The lecturers during the day include lawyers, IT personnel, co-blogger, educators, and more. Actually, we had Manuel Quezon III, Manolo as his nickname, as one of the speakers during the event and he was very eloquent in stage and clever in addressing queries thrown by the participants. There were also a couple of opportunities given to the attendees to pitch his/her personal blogsite. Some of the colleagues have even had own paraphernalia like mascot and tricks to promote well their individual URL addresses. Sadly, I didn’t take a step of courage to promote mine - probably I was a little intimidated with the way how their unprepared speeches delivered freely. I stocked myself and I just entertained the idea that I was an enrolled law student at the UP-College of Law – my frustration and childhood aspirations – sounds shallow… hmmm. Anyway, the not so quite appealing picture above evidenced my presence upon the culmination of the convention proper around five in the afternoon. It feared me a little that I couldn’t Kodak myself since my Motorala cellular was battery drained when I handed it. I hardly check my fone during the entire program for there was no network for SunCellular penetrating inside the hall. Although I had it fully charged during the morning, it slipped in my consciousness that my phone is frigophobic – a personal theory by the way. It’s kind odd that my battery meter is consumed faster when it is exposed the breeze of cooling machines and late did I know that I was seated just beside the door type air-conditioning unit. Nevertheless, it still permitted me to capture my first attendance in the summit but unfriendly enough to make another shot for my friend, Bren, since it went futile already. Guys, until the next summit (hope still with free food and snacks)…. SEE YOU THEN!!! This entry was posted on 5:24 PM You can follow any responses to this entry through the RSS 2.0 feed. You can leave a response, or trackback from your own site. Hello Yeng. 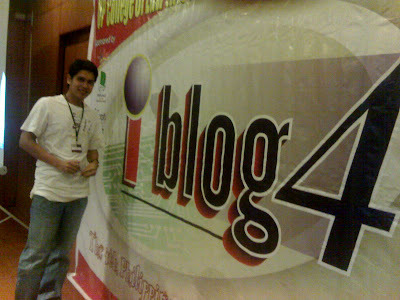 Thank you for taking time to be part of iBlog4 and hope to meet you personally next year. Your idea is good. It was passionate, full of inspiration and encouragement for those who didn’t know what blogging means…like me... The one that really hook my attention was your enthusiasm in uplifting our society. Hope I will find it soon, like in your previous write-ups...Keeps it running! hi janettetoral.. tnx.. tnx.. i hope to meet you also in the 5th summit..